Irish law firm A&L Goodbody is adding to its construction team in Dublin with the appointment of Conor Owens as a new partner. The construction industry has seen a surge in activity over the last two years. This is mainly due to more favourable economic conditions in Ireland. International construction consultant, Aecom, has predicted that the Irish construction industry will grow by 14% in 2018. Furthermore, the Irish government recently announced a ten year, €115 billion infrastructure upgrade programme as part of the 2018-2027 National Development Plan. * AIB on the development funding of the Exo Building at the 3Arena, the new 17 storey office block in the Dublin Docklands. * Target Investment Opportunities ICAV on the development of new headquarters for Grant Thornton in Dublin 2. * BAM Building Ltd on the construction contract for the New Children’s Hospital. 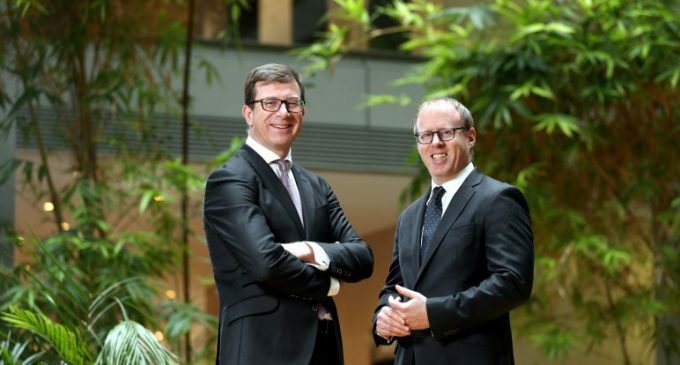 Pictured (l to r): Julian Yarr, Managing Partner of A&L Goodbody, and Conor Owens, new partner in A&L Goodbody’s construction team.